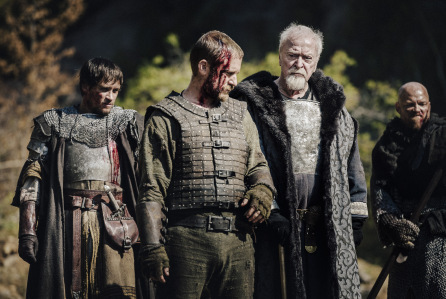 Courtesy of Deadline, here are the first look stills from the production of actor Ben Foster’s latest film, Medieval. Which you all know, if Ben Foster’s starring in a new film, we’re all excited around the ECMOVIEGUYS' offices.The historical action-drama inspired by the origin story of 14th century warlord Jan Zizka of Trocnov (Foster) is currently shooting in Czech Republic with Petr Jákl at the helm. The film also stars Michael Caine, Til Schweiger, Sophie Lowe, Matthew Goode and William Mosely. The images below are low-res, but we’ll be sure to keep you up-to-date with this film until its release later next year. Share this post with your friends! Jákl wrote the screenplay and is producing alongside Cassian Elwes, and Double Tree Entertainment LLC. The film is produced with the support of private investors, the Czech Film Fund, the Prague Film Fund and Creative Europe – Media. Additional support comes from Middle Bohemia Region, the Capital City of Prague and the President of the Senate of Parliament in the Czech Republic. Highland Film Group handles sales.